Disclosure: I agreed to conduct this review through my association with Sverve. I received a quilt from Lush Décor to perform this product review. Also, Lush Décor is providing a $200 Gift Card for a giveaway on The Mindful Shopper. All opinions stated are genuine and my own. I love it when companies use bamboo in their products! Bamboo is considered a renewable resource because it is a form of grass, and like a lawn, it can be harvested many times without harming the plant itself. 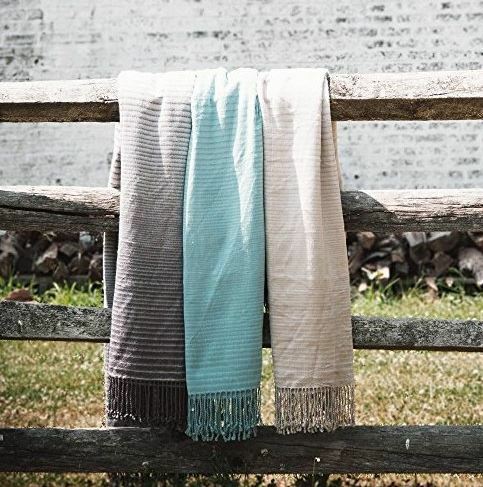 The Lori Bamboo Fiber Throws ($45 each) from Lush Décor come in lovely ombré-hues of cream, charcoal, and teal (pictured below). Blackout curtains are made of tightly woven fibers to help block sunlight from entering your home. Most blackout curtains feature neutral colors which tend to blend in with your home decor. However, if you are interested in fun, colorful blackout curtains- Lush Décor is definitely the company to check out! 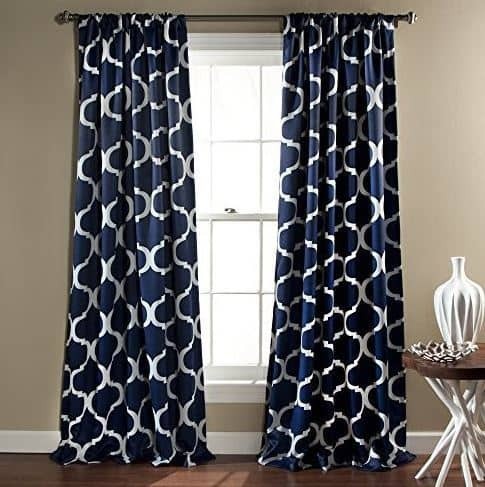 The Geo Blackout Window Curtains ($45 pair), pictured below, would definitely add a touch of color and class to any room. Instead of opting for a standard shower curtain, consider using a fabric shower curtain with beautiful colors and/or unique textures. 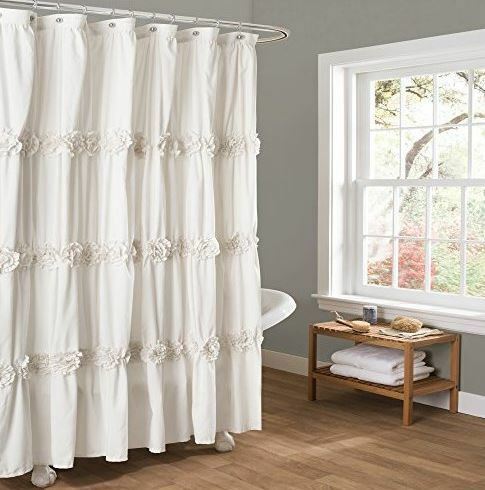 Lush Décor definitely has some fun fabric shower curtains including the Darla Shower Curtain ($25-$29.99), pictured below, which features ruching and fabric flowers. I was given a $75 credit by Lush Décor to select an item to review. I had a tough time picking an item given the numerous options. I was really interested in the bamboo throws, but was also drawn to the quilts. There were so many fun quilts; beautiful styles and colors. I felt there was something for everyone- a plus for me. After much thought, I selected the Layla 3 Piece Quilt Set in Orange/Blue. 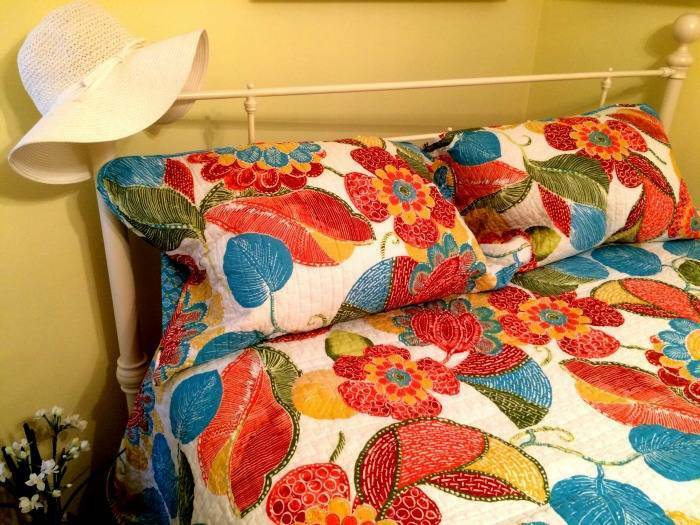 The colors in this quilt are lovely and definitely add pops of vibrant color to my guest bedroom. The quilt is somewhat stiff to the touch, but the description of the product on the Lush Décor website mentioned that this quilt will get softer with each wash. The price of this quilt is very competitive with other quilts of similar quality. You can buy Lush Décor products directly from their website by clicking HERE. Lush Décor is providing an exclusive 10% off coupon code (LUVLUSH1) for Mindful Shopper readers! Also, Lush Décor is providing The Mindful Shopper with a $200 Gift Card for a giveaway! Thank you Lush Décor! That is a great giveaway. I need some new living room curtains! I have some curtains that I got from them. I love them! the quality is amazing! I will definitely be entering the giveaway! I could use more curtains for the rest of our house! Love the Lori bamboo fiber throws and the Avon comforter set. I just bought a new quilt but I do need a new shower curtain. Mine is old as the hills and I am really tired of it! i will check out their website then head to Kohl’s! Glad to hear you are interested in their products! Thanks for commenting! Oh I like those curtains! They look really nice! What an awesome giveaway! Thanks so much for stopping by! Feel free to enter the giveaway! Take care! I really love that shower curtain. Great giveaway too! The shower curtain seems to be a definite fan of the readers so far. Thanks for stopping by! I’d love to replace my old bedspread with the Star 3 Piece Quilt. What a great sweepstakes. That is something I could really use. My bedroom needs a major update. So glad these are items you could use! Thanks for stopping by! Those drapes are just beautiful! I could use that exact fabric in my bedroom. Ohhh, so much fun to know that these drapes would work for your bedroom decor! I bet your bedroom is lovely! So many beautiful items! I’m especially loving that shower curtain. wow, they have a ton of pretty things to explore. I really like some of the colors and patterns I’m seeing here. Thanks for stopping by! Yes, they definitely have some lovely items. So much fun to get to try out new colors and patterns! What beautiful linens! I think having great drapes up around the house – definitely makes it any space feel like a home! Oh my gosh, I LOVE that Shower Curtain! Gorgeous! I like the Flower Texture 8 piece Comforter Set. They have so many pretty things.One I love is the Nora 3 piece Quilt. This is really great and awesome. Thumbs up. If I won, I would like to get the Lux Six Piece Comforter set in white. My favorite item is the Avery 7 piece comforter set. I’m disabled and I have a very small income, which makes it very difficult to pamper myself with something nice. I love the Adrianne 3 piece Quilt set. My favorite is the Floral Paisely 3 Piece Quilt. This would be perfect for updating our bedroom. I really like the Lux 6pc comforter set. I’D LIKE THE MASSA 3 PIECE QUILT FOR MY DAUGHTER’S ROOM. My favorite is the Royal Empire 3 piece Quilt. I love the Paisley Patchwork 3 piece Quilt! Thanks!! I really love the Rosina Throw blanket, it looks very cozy! I’d really just like some nice, basic curtains like the Lucia window treatments! I like the Stella shower curtain. Thank you! I love the giselle 3 piece comforter! The Addington 3 piece Quilt is beautiful! My favorite Lush Decor item is the Monique 3 Piece Quilt Set. Thanks for hosting this giveaway. I am in love with the Aubrey 3 pc quilt set. Its so pretty and matches my bedroom! Glitter Sky 7 piece Comforter Set! My room needs more color!!! I would love to have some of their chevron black out curtains. I also really love the Glitter Sky 7 piece Comforter Set! So luxurious! I like the Milione Fiori 7 piece Comforter Set. My favorite is the Darla Comforter Set. I would like to order it from Lush Decor. If I won I would love to get the Aurora 4 piece Comforter Set. My favorite Lush Decor product is the sheer white window treatment. Oh I really love the Stella 3 piece Comforter Set! That is so beautiful! I like the Nora 3 piece Quilt. I love the Luxe 6 piece comforter set in gray!! It’s gorgeous and would loo great in my master! Oh, my, the colors are SO much more vibrant in your pics than on the website!!!! I love it! love the lux 6 piece comforter set. I love the Crinkle 3 piece Quilt in Green! 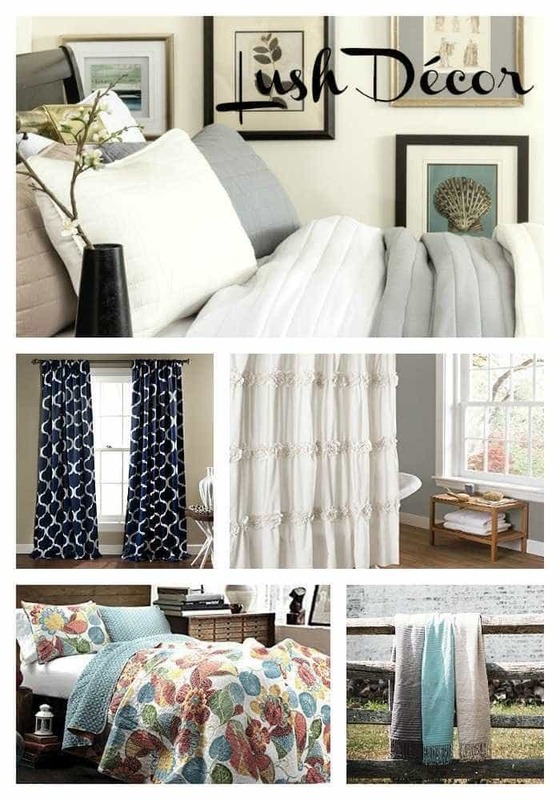 I love the Belle Window Curtain s for sure in the off white color….Very nice stuff! I really like this website and think that their products look fabulous! The Madelynn comforter set in lavender is GORGEOUS. My favorite item of theirs is the Estate Garden Window Curtain and I would get several panels for our living room. The sleeping bags that are coming are pretty and perfect,thanks so much. I love the Addington 3 piece Quilt in Pink! I like the Serena comforter set in white. Thanks for the chance! I’m loving the Giselle 3 piece Comforter Set, it would be so gorgeous in our new place! If I win, I will get the Berlin 2-Piece Quilt! 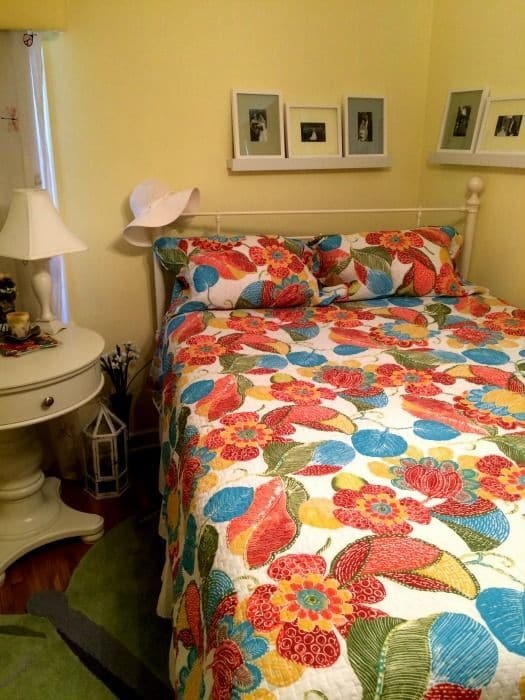 I love their quilts and throws! The Adrianne design is one of my favorites! My favorite Lush product is the Lydia 4 piece Comforter Set. I love the colors Baby Blue and Brown together. I love the geo blackout curtains! I like the new arrival Sophia 3 piece quilt set in fushia. I cant wait to see the furniture protectors when available. OH I am in LOVE with the Giselle Bedding set!! Thanks bunches for the rad giveaway!! We recieved the code for Lush Decor today and were able to purchase two comforters and two throws for the grandkids who are coming to visit. Just in time. Thank you. This is fantastic news! I am so glad you were able to buy some fun and functional items for your family! Congratulations!! !